We are one full week into the tour and we have "hit up" five schools across Nova Scotia thus far! Things are going swimmingly! 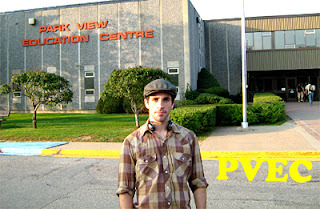 For our first week, we went to the Northeast Kings Education Centre in the Valley (the day after our first show), where we ran into some extreme technical problems, when our amp decided to not work approximately 20 minutes before the show started. Darcy ran off and tracked down the residential tech-student Russell who supplied us with a functioning cable, thus saving the day! 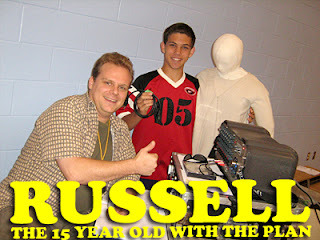 Russell was dubbed "the man" for the day. On Thursday we travelled to the South Shore to my hometown of Bridgewater/Lunenburg, where we performed at my former high school Park View Education Centre! I had a ball. Really. 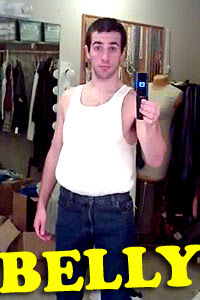 It was a bit odd, though; performing a play about alcoholism for the younger brothers & sisters of people with whom I used to get absolutely shitfaced with. I felt like an imposter, and that they all knew my boozey ways. Thanks to everyone involved in that day. It was a pretty rad day in my life. I apologize for the lack of exciting stories, but I brought lots of pictures to make you happy! Tomorrow morning we leave for Chipman, New Brunswick (a 4 hour drive) and we will be on the road until Friday evening so until then, I'm sure I'll stumble upon something worth writing here; and if not, I'll just make it up! To track our footage, check out Neptune Theatre's Google Map of our Tour!! Bon voyage! Saturday was our big final day of preparations before we started the tour on Monday, so we packed up the van. 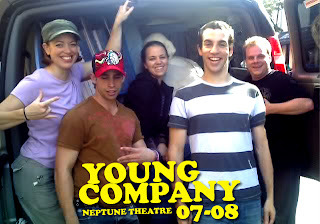 Here we are, Neptune Theatre's 28th Young Company featuring (as pictured below) Kim Parkhill, Adam Bayne, Gillian Ferrier, Glen Matthews (what?what?) & our stage manager Darcy Lindzon. 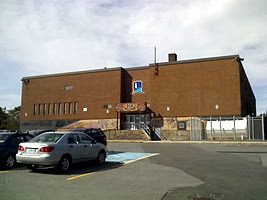 Today we started off our tour with a showing of "Liars" to Herring Cove Junior High School. Children: Hey, are you in the play? 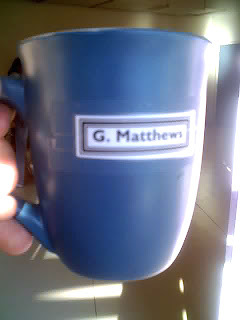 Glen Matthews: Well yes I am. And then they ran off into the school. This tour is going to be awesome. I mean, where else do you get to experience random-assed conversations like that? The kids were ushered into the gymnasium, we put on pre-show music (Sk8r Boi), then rocked some theatrical socks. The kids were ridiculously responsive and fantastic. 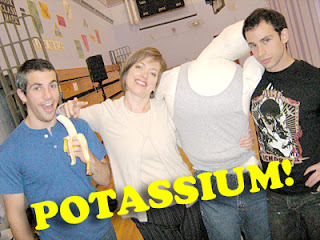 During Adam & Gill's stage kiss that kids went bananas (B-A-N-A-N-A-S). Those little kids are perverted. Anyways, just wanted to let the masses know that our tour has started off on a great note, and I will try to keep sharing stories from the road for y'all to enjoy! We head out to Canning tomorrow, then Dartmouth on Wednesday and then Bridgewater to hit up Park View, my former effing High School! So that's pretty intense. Thanks for reading! We are now in our third week of rehearsals and now have less than one week before we depart on the great conquest. For the past three weeks, we have been hard at work rehearsing. Therefore, I don't have many/any traveling tales to share. All that good stuff comes in the next couple weeks! 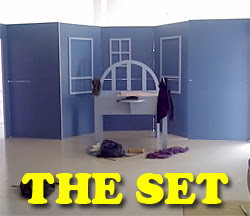 Here's our set for our elementary school show "A Bump in the Night"
Last Wednesday, during my morning rituals before rehearsal, I was rough-housing with my lady-friend Kristin, during which I went to bite her knee, when she kneed me in the mouth, during which I retracted my head at a quick speed, resulting in the back of my head absolutely smoking Kristin in the nose. After a visit to the emergency room, it was determined that her nose was still intact. It's almost a week later and her black eye is finally diminishing. That's all for now, next week we start our tour in Halifax and some down in my hometown of the good ole' South Shore, so expect a plentiful amount of updates in the coming weeks! Hello there, friends and internet lurkers, alike. 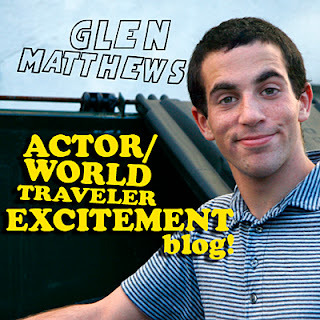 Welcome to my fresh-out-of-the-womb "Glen Matthews: Actor/World Traveler Excitement Blog!". 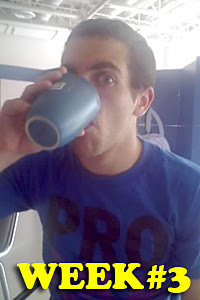 Recently, I have become employed by Neptune Theatre as a member of their Young Company. The purpose of the Young Company is to travel around the Atlantic Provinces of Canada and put on plays for kids in elementary & junior high schools, and introduce them to the theatrical arts. Pretty cool. This allows me to be a tourist in my own "hood", as I am going to be visiting every nook and every cranny of the Maritimes. In the coming months I will be visiting New Brunswick, PEI, Cape Breton and a good portion of my time will be spent on the mainland of Nova Scotia. I will be departing the 23rd of September towards somewheres within Nova Scotia. I will be joined by my cast mates Adam Bayne, Gillian Ferrier & Kim Parkhill (in alphabetical order because I haven't decided which ones of them I like best, yet), and directed by my Pre-Professional Training Program instructor Samantha Wilson, and Stage Managed by Darcy Lindzon. We began rehearsing almost a week ago on Monday, and during my first morning as an employee of Neptune Theatre, I was presented with my very own mug, with my name scotch-taped on the side. Rehearsals are well under way and we are working hard on getting ready to bring this bad-boy to the stage for the rabid children to devour. 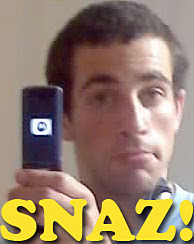 Stay tuned for 2-megapixel photographs taken from wherever the tour takes me, and more hilarious anecdotes. Excitement!